He led India to Independence. He did it because he was thrown out of Train. Watch this. Yes, You are right!-Mahatma Gandhi. 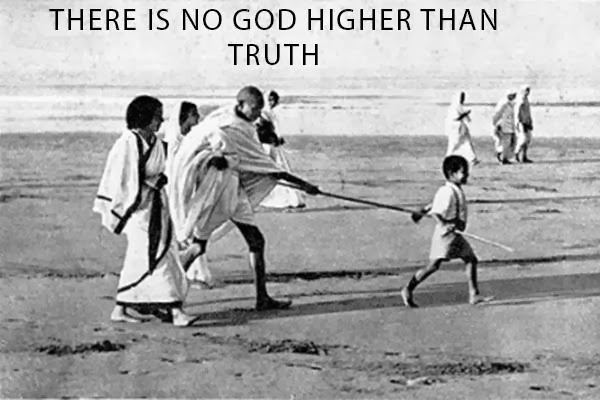 People called him with great love and respect Bapu, meaning Father. 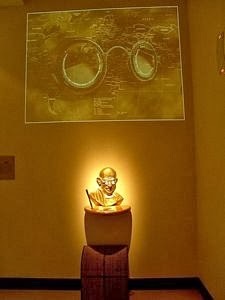 When in Delhi, it is almost like a Crime to Yourself (I am exaggerating though..he he) not to Visit well preserved attractions/destinations of Mahatma Gandhi. Have I got your attention yet? So without further ado...I will take you to a visual journey of these places and you will learn how to reach there, What to expect, and much more. So are You ready? Lets Go! This place is not to be missed when in Delhi without a doubt. 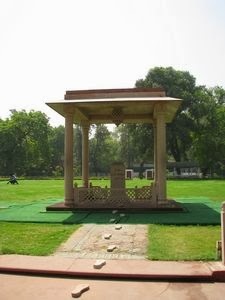 This is the place where Mahatma spent his last 144 days. Post independence of India, here he used to spun the khadi. The place really immerses you in his life and philosophy. It is marvelous being at a place where you know an Amazing human being once lived. It is so moving to find Gandhi raised foot-steps along the path of the garden only going out and not returning. The whole place has an extraordinary feeling of peace and spirituality. In the museum, you can find his simple room and glasses. There are lots of photographs, information and artifacts, so have 2-3 hours in hand to spend here. Birla house preserves the site of Mahatma Gandhi. 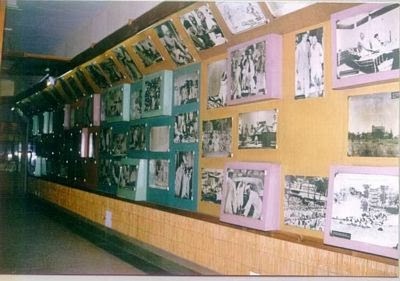 You will also find - Eternal Gandhi Multimedia Museum established in 2005. 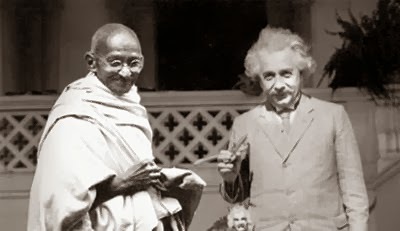 The museum presents historical records of Gandhi's life. 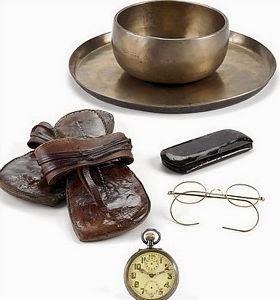 "Did You Know: At the age of 61 he decided to walk barefoot, 388 kilometers, the famous Dandi March (Salt March)" (Click to Tweet) Timing : 10:00 am to 5:00 pm. Let's move on to our next destination. 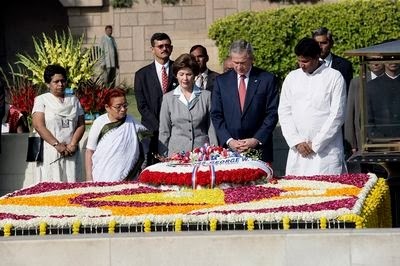 This is a Open-air memorial to Mahatma Gandhi. 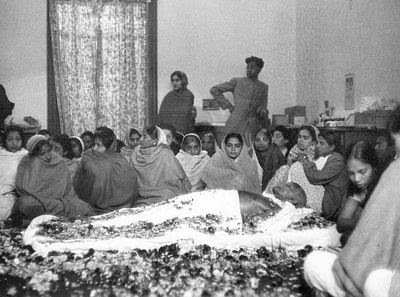 This is the place where he was cremated after his assassination in 1948. VIP's like earlier US President George Bush, Bill Clinton, Russian President Vladimir Putin visited here to pay their homage. Every day hundreds of people visit to bow in reverence to Gandhi's Memorial, made of Big Square Granite Stone. The memorial is set in a beautiful garden, very pleasant surroundings. It has a peaceful aura to it. It also has a huge landscape and you are certainly going to love it! 30 - 45 minutes is sufficient to explore the place. Timing : 10:00 am to 5:00 pm. Located hardly 350 metres from Rajghat, across the road. The museum collects and preserves Gandhi's records, like his letters, correspondence, films, books, photographs, including voice records. The museum first opened in Mumbai, but then later moved to Delhi in 1961. The Museum boasts of a library with more than 27,000 titles. You can find a nice collection of rare photographs. you can easily spend 1 to 1.5 hours exploring the place, reading books and scanning the huge collection of photographs. on Saturdays and Sundays film shows are screened between 4 to 5 pm. 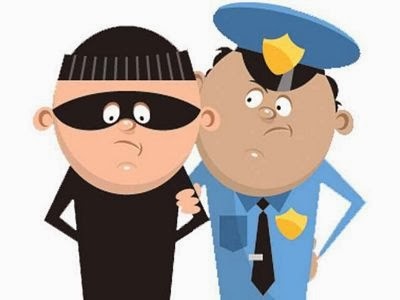 As you can see on your right, courtesy : TOI . 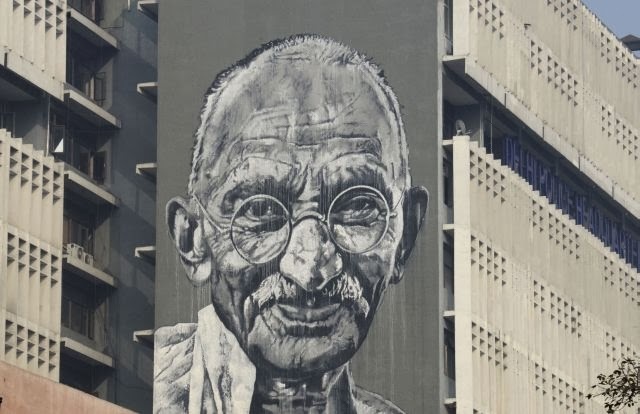 The portrait spread over a gigantic 150ft x 38ft wall, is being touted as the tallest Gandhi mural in the country. 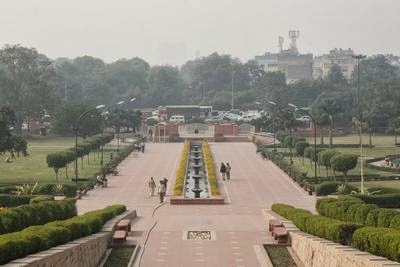 You can take a glimpse of this gigantic portrait with a Hop on Hop Off Bus drive pass, between Raj Ghat to National Gallery of Modern Art on Red Route.